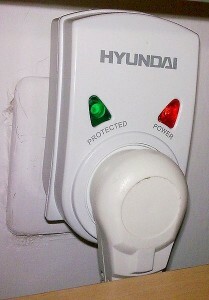 All computer users should know how to choose a good surge protector. A good surge protector is a great investment for anyone who values his or her electronics. An unexpected lightning strike can fry all components in a house and leave a consumer devastated. Although, this is largely unavoidable there are steps to take to ensure less powerful surges do not damage equipment. Knowing how to choose a good surge protector enables you to protect computers and other appliances from these unwanted surges. Before heading out to the store to get a new surge protector there are a few things to consider. Consider the value of the electronics you are trying to protect. Write down the sum value of the items and keep it for later. This will be useful when picking out a surge protector at the store. Buying a surge protector at a store enables you to see exactly what you paid for. This is important because the length of the surge protector must reach all the desired electronics. Of course adding an extension cord will solve this problem but the warranty on the surge protector may be voided. The warranty on a surge protector covers a certain amount of dollars in damaged property. Use the sum you wrote down as a guide when choosing a surge protector. Make sure the amount on the surge protector is more than the total sum in case you decide to add more. In the event of an extension cord being necessary be sure to use the shortest one possible. It should also be three pronged and be compatible with the surge protector. Another requirement of knowing how to choose a good surge protector is being aware of the amp rating on the device. The amp rating will tell you how many appliances you can plug into it. Be careful not to let the surge protector get warm or overheated. If this happens, take the unit back to its place of purchase and get a different one. The wires should also never become hot or they run the risk of melting and causing a fire. The joules rating on the surge protector is very important when considering how much protection you want. Higher joules means better protection. So get the surge protector with the most joule rating. Common ranges are 1000 to 2000 joules. Be smart when using a surge protector. In the event of a lightning storm consider unplugging all valuable electronics to prevent lightning surge damage. Investing in a UPS is a great way to protect against sudden power failures and lost data and is a part of basic computer maintenance. UPS is short for uninterruptible power supply and can be found at the local computer retailer. You can never be to careful when protecting expensive electronics, so be sure to know how to choose a good surge protector.